There are 5 breeds of lop eared rabbits in the USA: Holland Lop rabbits, Mini Lop rabbits, English Lop rabbits, French Lop rabbits, and American Fuzzy Lops. Among these five lop-eared rabbit breeds, just about the only thing they have in common are their lopped ears. 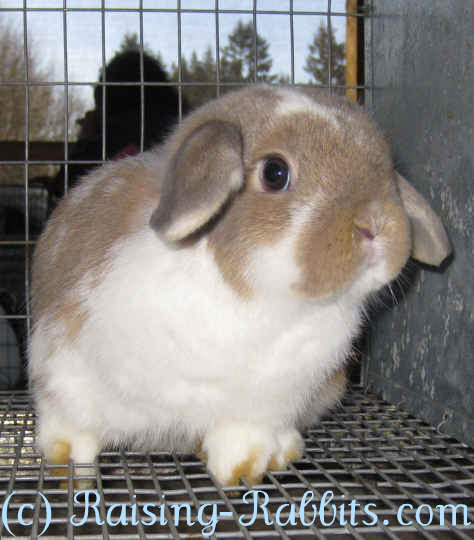 This lop eared bunny is a cute little fuzz-ball! 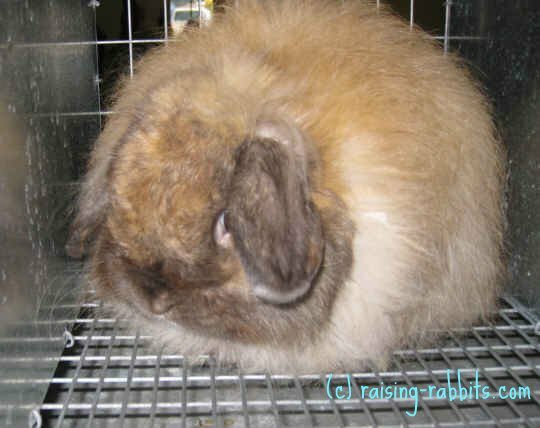 The American Fuzzy Lop is more or less a Holland Lop dressed in an Angora wool coat. If the little guy weighs more than 4 pounds, he’s too big. They come in broken and solid varieties. Fuzzy Lops have lop ears, thick feet pads, and thick body wool that is at least 2 inches long. They make great pets and show animals, as long as the owner has time for grooming the Fuzzy Lop's wool. Yes, in a Fuzzy Lop, the fur is called wool. The second lop eared breed is the Holland Lop. These are a very popular breed - second in popularity only to the Netherland Dwarf (not a lopped breed), Holland Lops weigh less than 4 pounds, and are very perky. They come in many solid and broken varieties, and are posed on the show table with head up and alert. They make wonderful pets. Holland Lops are cute as buttons, but how about lop-eared rabbits whose long and amazing ears just don't quit...? 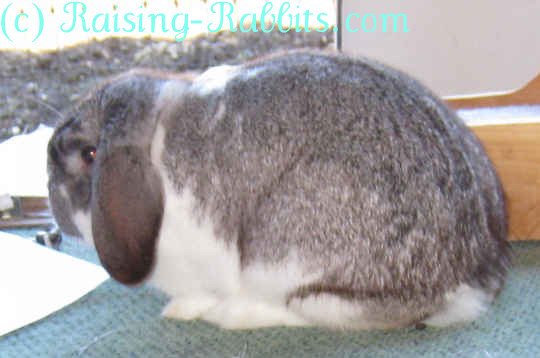 The third floppy eared rabbit breed is the English Lop. 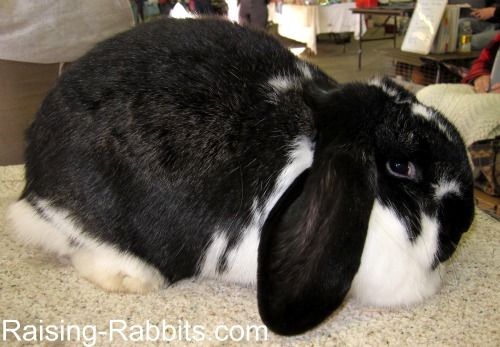 This very old rabbit breed is a large to giant, weighing in at 9 pounds plus, and has no maximum weight. They can grow just as big as their genetics will allow. English Lops come in lots of colors and broken varieties. English Lops have enormously long ears! They hang lop eared, very wide and at least 21 inches tip to tip. 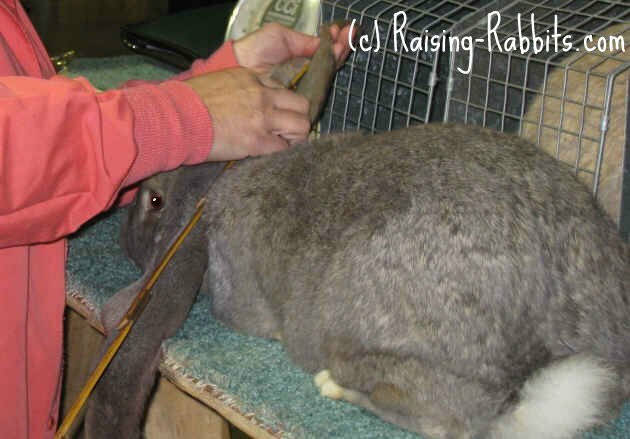 Extra care and a large cage will help them not step on those long ears or get them cut or scuffed. The fourth, and possibly the largest lop eared rabbit breed in the USA is the French Lop. The French Lop is truly a massive rabbit. The French Lop should weigh a minimum of 10 1/2 pounds; no maximum weight is specified in the Standard of Perfection. The rabbit above weighs in the range of 13-16 pounds. Everything about a French Lop is solid and hefty. Their ears are lopped, tipping just to the table. Not all French Lops grow to prodigious weights, but some French Lops do. Pictured at left is a truly massive rabbit. This French Lop rabbit, Humphrey, weighs in at 28 pounds and 42 inches long. At 18 months old in the picture, his owner says he's still growing. Once the world record-holder for world's largest rabbit, he was recently displaced by a Continental Giant weighing around 40 pounds. Mini Lop rabbits are ‘cousins’ to Holland Lops, and resemble them, except for size. Mini Lops weigh up to 6 1/2 pounds instead of the maximum of 4 pounds set for Holland Lops. The word ‘massive’ describes Mini Lops as it does French Lops, but on a smaller scale. There should be nothing ‘narrow’ about this breed. As with the other lop breeds, Mini Lops can be found in a multitude of solid and broken varieties. Lop eared rabbits come in the above five varieties in the USA, however around the globe one can find another 11 breeds of lop-eared rabbits. 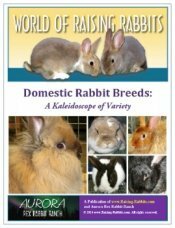 Learn more about all domestic rabbit breeds, including all 16 lop eared rabbits, through our e-book, Domestic Rabbit Breeds, A Kaleidoscope of Variety, described and linked below.